Homemade Pepperoni Pizza Rolls are perfect for a crowd, and completely addictive! 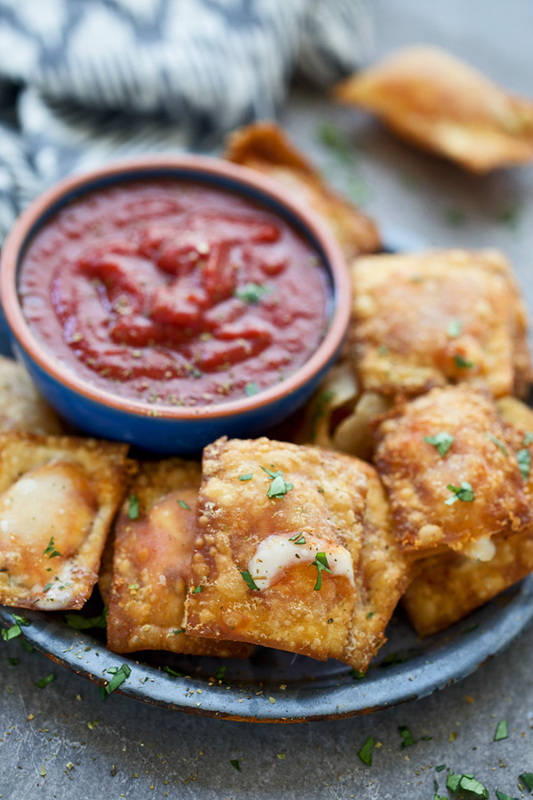 Serve with pizza sauce for the perfect Game Day bite! Fill a heavy-bottomed pot with thee inches of oil. Bring up to 350 degrees. Whisk tomato paste, water, garlic, salt, sugar and oregano in a small bowl. Use a pizza cutter to cut each egg roll wrapper into four equal rectangles, they should be x by x.
Toss mozzarella, pepperoni and green pepper together in a small bowl. Working with four rectangles at a time, brush each with water and two teaspoons of the cheese, pepperoni and pepper in the middle of the bottom half of each wrapper, followed by a 1/2 teaspoon of pepperoni and a few pieces of green pepper. Fold over and seal edges, making sure there are no air bubbles. Once all the pizza rolls are formed, work in batches to fry until golden brown, about 1 minute per side. Drain on paper towels. Serve with leftover marinara. 0 Response to "Homemade Pepperoni Pizza Rolls"